After the earlier talk bout Gouken’s daughter. I actually went back and did what we talked about. I revamped her concept, changed her origin, gave her mother a name, modified her move set, added an ending, and created win quotes. Appearance: Gouka has light brown eyes. She has a golden headband tied around her forehead. Gouka has long knee length straight black hair. She wears a brown sleevless gi that is tied at the waist with golden twine rope. Gouka has on brown hakama pants. She wears prayer beads around the wrist of each of her hands. The prayer beads around her left wrist feature the “ten” symbol on one of the beads. The ones on the right wrist feature the “mu” symbol on one of the beads. Gouka has sandals on her feet. Tone: Gouka is a calm and focused woman. Her fury was tempered by her father’s calming presence. She forges a new path in a quest to surpass him. Gouka is the daughter of Gouken and granddaughter of Goutetsu. While he trained with Goutetsu and his brother Gouki, Gouken became involved with and fell in love with Goutetsu’s daughter Kouhana. After Goutetsu’s death at the hands of Gouki. Kouhana began to sour on the martial arts. Ansatsuken had brought them all together. Gouken and Gouki were like sons to Goutetsu. Yet the lure of Satsui No Hado proved more valuable than family to Gouki. Gouken’s purely defensive style of Ansatsuken set her mind at ease for a time. She’s even practice would Gouken at times. As tt brought back memories of her father. That all ended one day. Gouki returned to challenge Gouken just as had with her father. While Gouken defeated his brother and showed him the mercy he did not show Goutetsu, Kouhana had enough. When Gouken went off to town to get supplies for the week, she packed up her things and left. Leaving behind long letter explaining why she could no longer endure this life. How she feared she’d come home one day and find Gouki standing over Gouken’s lifeless body. It was a few months later that she discovered she was pregnant. She thought of returning to Gouken. She would not put their child through the dread she feared. Gouka grew up without her father in her life. She would ask about him. A look of sadness would come over Kouhana’s face and she would tell Gouka what a good man her father is. Kouhana would explain that he couldn’t know where they were because it wasn’t safe. That her uncle was a danger to them. Soon Gouka stopped asking about her father. She’d go through her mother’s things while was away. Eventually she found photos of her grandfather, father, and uncle. She also found several manuals describing various martial arts techniques. When her mother would go into to town, Gouka would practice the techniques from manuals she found. Training made her feel closer to her father. Gouka had a natural talent for the martial arts. She managed to hide her secret training sessions from her mother for years. By the time she was 12, she had started training with the kids from the local martial arts school. Gouka would be able to put into practice what she’d be studying. While her mother thought she was playing with friends, she was teaching herself to fight in the style of her father and grandfather. Unbeknownst to Gouka, her mother had figured out what she was doing some time ago. She tried to turn a blind eye to it. Hoping it was a phase that would go away. With each passing year, it became harder and harder for Kouhana to hide from the truth. Gouka had become quite the fighter by her 17th birthday. One day a mugger snatched away one of her mother’s grocery bags. Before Kouhana could intervene, Gouka charged after him. She took him down with ease, returning to her mother with the bag and a huge grin on her face. Kouhana was stunned. She could no longer deny what was right in front her. Gouka was every bit her father’s daughter. She swallowed her pride. Kouhana told Gouka to gather her things. “It is time you met you father.” While Gouka was ecstatic, barely able to contain her excitement, Kouhana was filled with dread. 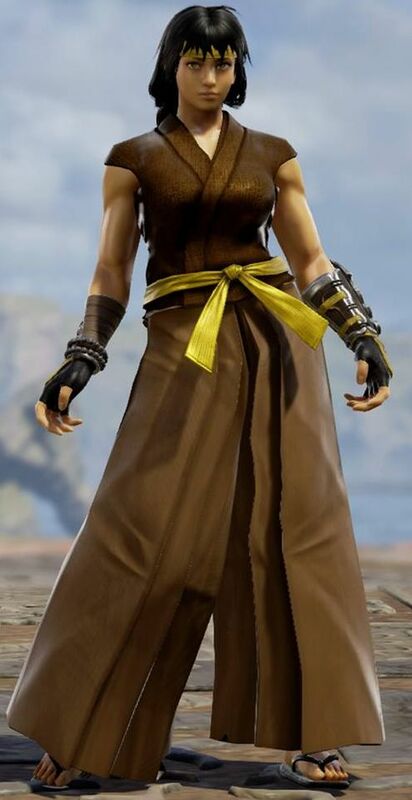 “What will I tell Gouken” she thought to herself. Soon she would be filled with dread for another reason. As the mother and daughter neared Gouken’s dojo, Kouhana caught sight of something at the nearby waterfall. She dropped her bag and fell to her knees. Gouka went to see what was wrong with her mother. Her mother’s eyes were locked on to something in the distance. Gouka turned to see to warriors in combat. Without thinking, Gouka charged off towards the waterfall. As she neared the fighters she heard “Shun Goku Satsu!”, Gouka was blinded by a brief flash. She saw one of the fighters falling into the waterfall below. “MASTER GOUKEN! !” she heard to voices ring out in near unison. Two young fighters one in a white gi and the other in a red gi charged towards the victorious fighter. At that moment, she realized who had fallen into the waters below. She jumped into the water, pulling the bloody, and wounded fighter to the nearby riverbank. Her teary-eyed mother was already there. “Gouken…” she cried out dejectedly. Kouhana placed her hand on the bloody warriors chest. “He’s still alive! Hurry Gouka we must get him out of her before your uncle sees him.” The two women hurriedly fled the area. Gouka and Kouhana would bring her father to their home. They nursed him back to health. Kouhana rarely leaving Gouken’s bed side. Gouka on the other hand did nothing but train. Everything her mother said about her uncle was true. If her uncle came for her father again, she would be ready. Gouken awoke after a few days. His defense against the Shun Goku Satsu was not as effective as he hoped. He was surprised to have surprised to see his wife and a near grown daughter at his bed side. Gouken’s mastery of Mu still needed work. He would perfect his technique with his daughter training beside him. Harae (Purification) – D+MP (In Air): Gouka hits her foes with an downward chop for the apex of her jump. Attacks halts her forward momentum and travels directly downward. Tenshi Hakyaku (Angel Blade Kick)- D+ MK (In Air): Gouka executes a steep angle (70°) diving kick from the apex of her forward jump. Shinkai Geri (Deep Sea Kick) – DF+MK: Gouka performs an upward crouching kick attack. Forces crouching opponents to stand. Despite appearances, this attack is not a good anti air option. Senpu Kyaku (Whirlwind Leg) – F+ HK (overhead): Gouka hops forward striking with a one hit whirlwind kick. 70 Damage/100 Stun, 22F Startup -6 on block. Kongoshin (Diamond Body) – F+PPP: Gouka stomps the ground violently while executed a powerful back fist that sends the opponent a full screen away. Tenshi Shuretto (Angel Vermillion Rending Blade) – MP+MK: Gouka assumes a defensive posture to counter her foes attack. If successful, Gouka teleports above her opponent and attacks them will falling knife hand chop to the head. Resembles a more powerful version of her Harae aerial downward chop . B+MP+MK counters jump in attacks. D+MP+MK counters low attacks. Nullifies projectile attacks but the counter portion of the attack only applies to physical attacks. .
Hado Kakusei (Surge Awakening)– HP+HK: Gouka shows her foe true mastery over Mu No Hado. All of her projectile attacks are in enhanced. Gains access to her ultimate Hado techniques. The Kagutsuchi Go Hado and Sujin Kouu Hado. Kyoushin Jiraiken – Damage and Stun out put increased. (10 damage/20 stun) HK causes a hard knockdown. EX version causes a ground bounce. Fujin Go Senpu – Can now be performed from a forward and backward jump. Shomei Go Hadoken (Lightning Strong Surge Fist) - QCF + P: Gouka pulls back her right arm, focuses a sparking chi in her palm, and hurls a one handed horizontal projectile at her foe. Damage, startup, and recovery are the same for LP,MP, HP versions. 46 Total Frames 50 Damage/90 Stun. Button strength only alters the speed of the projectile. EX 44 Total Frames 80 Damage/120 Stun, hits twice, and knocks down. Gouka has trained with her father since he survived his apparent death at Gouki’s hand. His lesson would refine her rough self taught Ansatsuken into a powerful style of her own. To her father’s chagrin, she would not seal off the Satsui No Hado. Gouka has chosen a path of balance, she would wield a style that combined her father’s Mu No Hado techniques with her grandfather’s traditional Satsui No Hado techniques. Her balanced Kinkou Anstatsuken would bring her uncle to his end. Gouka tracks down her uncle Gouki (Akuma). They face off at the very same waterfall she pulled her father from years ago. Gouken and Kouhana see the pair clashing from a distance. They rush toward the two fighters. Gouken leaving Kouhana behind as he shows surprising speed for a man of his size. Just before he can get to his daughter and brother, Gouken hears “Rajin Go Shoryu! !” and one of the figures goes sailing into the air before falling towards the waters below. A battered and bruised Gouka stands victorious. As the ending comes to a close, a brief time skip is shown. Gouka is standing alone on a large rock formation at Apo Island (Phillipines). She shouts “Shinsai Sokaigen” (Earthquake Disaster Twin Crushing Raise) as she slams her fist into the ground, shattering the rock formation into dust. Her task maybe complete but she still seeks to improve. Kouhana is only 5’4” (1.63m) tall. Gouka has been taller than her mother since she was 11 years old. Gouka is self taught until she was 17. Teaching herself the unrefined Satsui No Hado based versions of the Hadoken, Shoryuken, and Tatsumaki Zankukyaku from Gotetsu’s old manuals. She is 17 years old when Ryu defeats Sagat. Making her six years his junior and three years older than Sakura. During the events of SFA through SFIV, she trains with Gouken. Until now, she has only heard of Ryu and Ken. She has never met them. Out of concern that my previous quick and dirty the 3d model calculation was inaccurate, I went back and tested two of Juri’s SFV models with a bit more care. I found that my first quick and dirty test was way too quick and dirty. This time I also ran the final numbers with Juri’s Battle Outfit, which not only has less obstructive clothing, more of the original body mesh exists under its clothing. The final, most forgiving tests came up with a bust and hip figures that were a few centimeters above of Juri’s final SSF4 official stats. Trusting those figures are relatively close to “accurate”, and thus her band size is also theoretically accurate, SFV Juri’s model is in the range of a DDD cup, potentially pushing towards an F cup. I’ve now spent way too much time trying to figure out cup sizes of 3D video game models, even if I try to justify it as a 3D modelling program learning process. Ooh, these are awesome! Again, something about G’s placement makes me think he’s ominous, future boss material. Capcom still needs to reveal Gill in the SF5 series as a playable character or something. I remember in my pre-internet days that seemed to be a speculation among people. Done right it could be cool. I don’t want them to do the typical “So and so is really Cain from the bible” type of reveal or that he descended from him. I remember Cestus and others have mentioned the idea of him being a solider, possibly a nazi being intrigued by the mystic arts and chasing them. Having him being pretty old and changing his identity over the years due to his immortality until finally, in the modern day, being able to literally get new bodies could be cool. Speaking of the bodies thing. How do we, @Daemos in particular, want to approach that. Has Bison always looked pretty similar to how he is now, or did he look different in the past? Maybe the current looks we’re used to aren’t that much different from his original body, but they’re more idealized. Perfect teeth, square jaw, perfect muscles and so on? Or did he once look totally different? The Witcher 3 - Hearts of Stone DLC did something which this reminds me of this. At some point Geralt - the main guy - agrees to be possessed by the spirit of a dead guy for a period. At first it looked a bit off, but then you’d see the whole expressions and mannerisms change, and pretty soon, despite the physical nature of the face being the same, with the new expressions and crap, it looked like somebody else almost playing the same character, even down to a jutting jaw and weird grin. I remember Cestus and others have mentioned the idea of him being a solider, possibly a nazi being intrigued by the mystic arts and chasing them. Having him being pretty old and changing his identity over the years due to his immortality until finally, in the modern day, being able to literally get new bodies could be cool. I believe it was me and @Yagamifire, that has there fan fiction on that. I have 2 version one is where I tried to build around with Vandal Savage in DC universe. I’m Bison fan. Body Fat Percentages start with Cammy . Giving how ripped she is. I say her body fat percentage would be near 12% or at 14% . So basically m.bisons vandal savage? I can dig it.